The History of the Plymouth High School "Blackhawks"
The town of Plymouth is situated on the eastern border of Hancock County in western Illinois. The town and its 562 residents are located on Il. Rt. 61 approximately 17 miles southwest of Macomb. The first Plymouth School building was a one-room log cabin school house that was erected in 1836. This building was replaced by a wooden structure in 1851. This structure, in turn, was replaced by a brick structure in 1856. 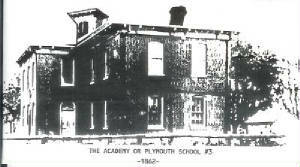 An association called the "Plymouth Education Society" was formed in late 1855 to early 1856. After some dissention and bad luck in attempting to erect the brick building, it was finally finished in 1862. The building was named the Academy of Plymouth School. It was 40' X 50', two stories high, had four class rooms, a recitation room, and could accomodate 200 students comfortably. An addition was added to this building in 1915 and a four-year high school was established. From 1883 until 1915 the school was a three-year high school. The first graduating class of 1883 consisted of four girls. The first graduating class from the four-year Plymouth High was made up of 14 students. A gymnasium was added to the school in 1920. Plymouth High School was recognized and given approval by the State of Illinois in 1947 to proceed as a Community High School District. This meant that several of the surrounding country school districts would consolidate to the Plymouth School District. In all, fourteen separate country school districts would consolidate to the Plymouth Community High School District. In 1949 a three-room school building was added to the Plymouth school complex for grades 3-6. In 1950 an agricultural building was added. 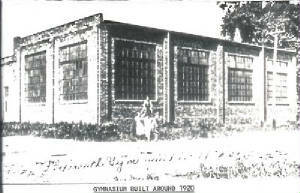 Also in 1950 the Plymouth School District secured funding for a new gymnasium. In 1955 the final addition was put in place as part of the Plymouth school complex. This addition would have 15 classrooms. 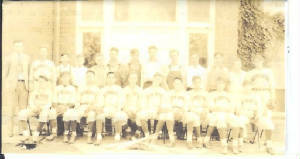 The largest class to graduate from Plymouth High School was the class of 1936 with 40 members. The smallest class to graduate from PHS was the class of 1905 with only one graduate. The final graduating class of 1992 had a total of 13 students. Student enrollment and financial concerns took their toll on the Plymouth High School future. In the late 1980's and early 1990's, consolidation talks arose between the neighboring towns of Plymouth, Augusta, and Bowen. This effort was realized in the spring of 1992 with the creation of the Southeastern School District. The high school for the new school district landed in Augusta. Plymouth school buildings now host the Pre K-4th grade classes for the Southeastern School District. And stand back of you. Plymouth HS Baseball - 1920s? Plymouth HS athletes enjoyed many great seasons in various sports the school offered. The school faired well in boys basketball and baseball. The school's nickname was the "Blackhawks," named after the famous Native American Chief Blackhawk. The best records in these sports according to the IHSA web site (www.ihsa.org) are listed below. Coach Dave Swisegood appears to be the only name one needs to know regarding PHS Baseball. Coaching from 1955-1980, Coach Swisegood's teams compiled an incredible record of 411-217. Included were two Regional Championships and nine "20+" game winning seasons. 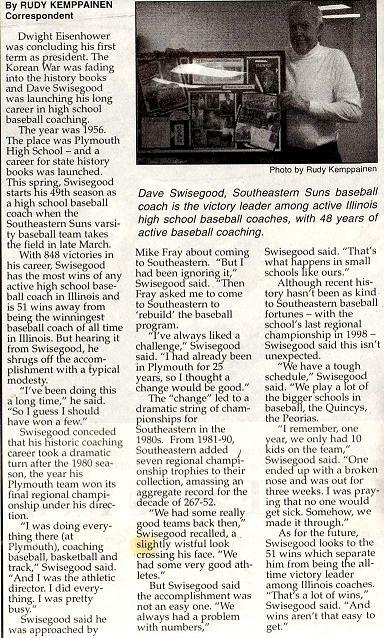 In fact, Coach Swisegood is still the skipper of the Augusta Southeastern baseball team to this day (2010). He is currently the winningest coach in IHSA baseball history! The best of the Baseball seasons recorded are listed below. Plymouth HS brought home three District titles and one Regional championship during its existence. Information regarding the better records and coaches at Plymouth High School are being sought. The more successful teams are listed below. On maybe of a lesser note, the Plymouth Basketball team had a 46-game losing streak from 1988 to 1990. Were there any positive memories of those years? Surely there had to be. The girl's volleyball team at Plymouth High had some very good seasons in the 1980s. Their coach was Deb Rakers, who started at the school in 1980 and stayed with the volleyball program through the last year of existence for the school. Though never winning any IHSA hardware, Coach Rakers did win 115 games in her 11 seasons at the school. PHS' best years are listed below. "I attended Plymouth (schools) from 1974 to 1987. The school colors were black and orange. The nickname was the Blackhawks (after Chief Blackhawk). Our school fight song was 'The Director.' Both of my parents were 1965 graduates of Plymouth HS." "I taught and coached at Plymouth from 1980-1989. I now coach at Marian Central Catholic High School in Woodstock, Il. I have great memories of my years at Plymouth and made a lot of good friends."